#WSIFF 2014: Selection Reviews, pt 2. The White Sands International Film Festival continues, and, let me tell you, if you are not attending some of the showings you are truly missing out! With a full schedule “packed with some of the most engaging, amazing and intriguing features, short films and documentaries anywhere” here is the second installment of reviews to help attendees plan the most advantageous viewing schedule. For full playlist schedule and trailers for the film submissions, click HERE. The opening film on the premiere night of the film festival was this beautiful film from director Rajeev Nirmalakhandan (who graduated for a local highschool here in Las Cruces, NM and is an instructor at NMSU’s Creative Media Institute for Film and Digital Arts). …At first I thought The Odd Way Home to be an odd film to head up the festival…I am so glad, now, that it did. If this film is any indication of future work from Rajeev Nirmalakhandan (which I believe it to be), then, Raj, please hurry and make more films! The oddest couple takes an unforgettable journey through the American Southwest, finding happiness in the unlikeliest of places and seeing in each other what no one else has seen before. Maya is a product of childhood abuse who escapes her shattered life in Los Angeles and meets Duncan, a hermit from a tiny town. He is socially awkward and a slave to pattern and routine, but a master of map-making and directions. Their journey teaches Maya to care for someone else and takes Duncan into a new world. Their road trip is filled with unexpected surprises and hard realities that redefine the notion of family. This film’s lead characters and its story are the strongest points of the film as they complement one another. 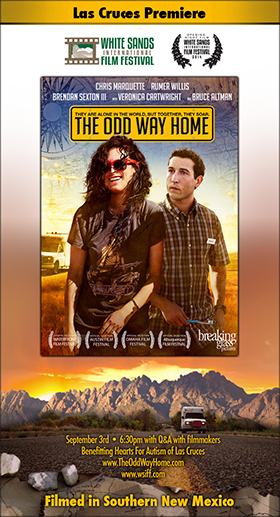 Chris Marquette and Rumer Willis are the oddest couple on their way home together who find an all new definition of the word “home” by the end. The Odd Way Home brings the right amount of heavy moments and then lifts the spirits directly after through the characters and their interactions with one another. I was delighted as I watched and realized many times that a smile was on my face. You will laugh, you will smile, you may shed a tear…it’s okay. Come along for the ride and let your heart enjoy The Odd Way Home. Take a road trip through the beautiful landscapes of New Mexico with Maya and Duncan. Experience their world for 87 minutes. I guarantee you, it will be a road traveled that will refresh and uplift your spirit. It is available to stream now on most OnDemand services. There aren’t many words to describe how one might feel after watching this beautiful tribute to film, classics and the preservation/promotion of them both. In Dollar Night an 80-year old employee of a classic movie theater tries to spark up some love for his passion of film in an effort to keep the establishment from closing. The lost art of film projection is on center stage here as the filmmaker gives plenty of time and tribute to the pastime that has entertained generations. The short beautifully gives a gorgeous tribute to film and how it can still be relevant in the lives of many today. Oh how I wish that more theaters would still show classics on the big screen. Passing the appreciation of classics to a new generation and teaching that movies are more than special effects, computer graphics, superheroes and explosions. I digress, however, the film’s cinematography, acting (the characters are beyond perfectly cast), musical accompaniment and its use of pieces of the past to relay its message is flawless. This is one of THE best shorts I have seen (I actually watched it three times prior to writing my review). 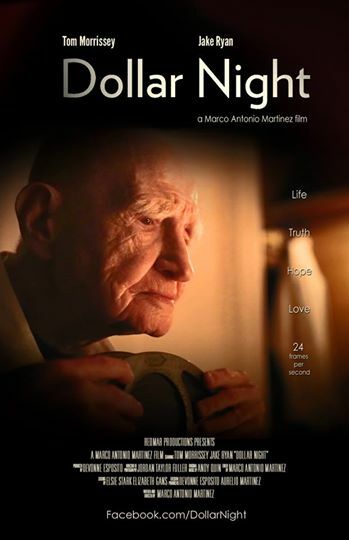 Movie-lovers, cinephiles and enthusiasts will find so much to love about Dollar Night as it touches the heart and makes us believe in movie magic that can make old things new and inspire life into a theater, a disheartened employee and a new generation. Betrayal and revenge. Two common themes in stories told down through the ages. Although, sometimes, vengeance isn’t enough. 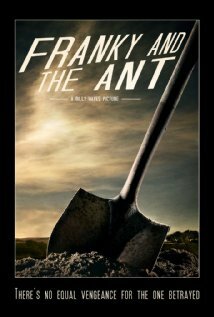 Franky and the Ant features a man betrayed and his route down the road of revenge. As he traverses down the troublesome road, he decides that the baggage he’s carried must be buried. This short’s camerawork and choice of actors is appreciated, however, at least for me, much of the story (and its title) were lost the first two times I viewed it. It is a film that is understood more when attention to detail is made as sometimes the audio inconsistently lowers and raises making the dialogue, at times, hard to understand. Franky and The Ant work together on this mission to complete the task when more revelations are made while the unequal, yet possibly deserved, vengeance is served. It is full of over the top acting, bad makeup effects and audio and inexplicable editing with intermittent scenes and clips to move the narrative along. Unfortunately the narrative barely moves and instead the film is reduced to a near 2-hour back and forth montage of screaming zombies, political propaganda, zombie killing, squirrels with hats on and a few clips of Stan Lee. It’s all on purpose which works for this type of film, but the ultimate purpose and plot are..well…misunderstood at best. It’s a bold endeavor and at times plays like a film project for school as opposed to a full feature. It’s a zombie dream but for some it may be a nightmare of walking dead. After a break-up, a man’s best friend arrives to get him out of his funk and back to the “field” doing all he can to lift his spirits. The two make a plan for the biggest meltdown every, complete with a foam party…and behold…plans may still end up being derailed. I thought of the phrase…well, to put it mildly…”Brothers before Others” as I watched this black and white semi-awkward comedy play out. It’s simple, it’s direct, it’s fun and the end is left to interpretation. Plenty of enjoyable scenes that, by themselves are somewhat pointless, but are craftily pieced together in the film to build the overall feel of the characters. It’s a solid short that made me laugh and wait in anticipation for the decisions that became inevitable. A fun piece that I did not expect to enjoy as much as I did by the time the credits rolled. Catch this if you can. Undercover is a short, staged mainly in a bar with a rookie cop participating in an undercover sting as a hitman for hire. Coached by detectives listening in who doubt his ability to catch “the mark,” this undercover cop may not have the wool pulled over his eyes so easily. Good casting for each part empowers the story to unfold and the rookie’s “training day” is one his fellow detectives will never forget. One of the things I enjoyed about this film most of all was its setting adding to the look of the film. The camera work in the smoky, dim-lit bar room really added to the immersive feel of the film and made it all the more enjoyable. Dark deeds done in dark rooms will soon be brought to light and…uncovered. With great purpose, this film teaches not only through its title but through its story that nothing is impossible and that if one doesn’t give up, even the goal that seems the most unattainable can be reached. Taught through the lens of great animation, use of sports and appropriate accompanying music, this short packs a punch and I can’t watch it enough. The ability for the filmmaker here to portray the message in such a short amount of time (the entire runtime including credits is 4 mins and 30 secs) is not only impressive but also inspiring and exciting. It will make you want to stand in the bleachers and cheer! Keep moving forward, keep pressing on, keep believing in yourself. 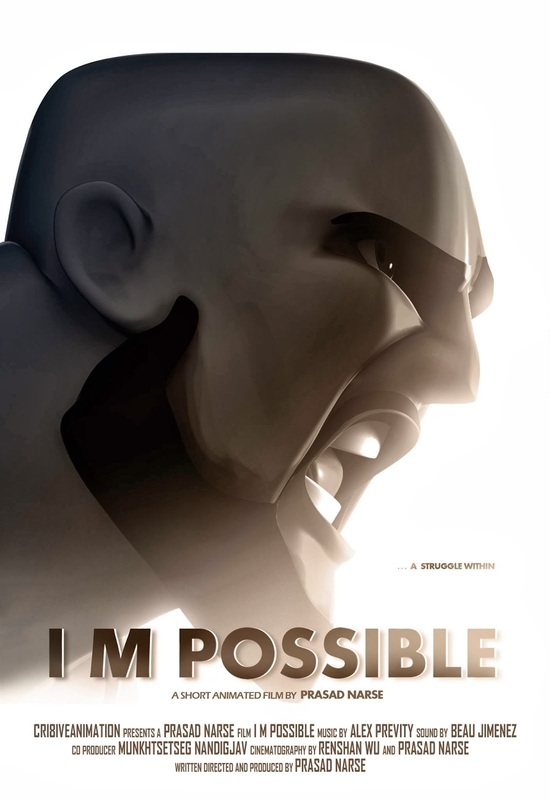 Let “I M Possible” be your creed. Don’t let there be a possibility of you missing this short. When an aspiring comic writer and artist finds himself both unemployed and uninspired, doubt and discouragement keep him down and cause him to seek purpose. Living in the urban jungle of Brooklyn, he struggles to keep his relationship, his motivation and his self-worth maintained and aimlessly grasps at passing opportunities to end up empty-handed. Falling back on the supportive friendships and memories he once had, will he begin to pick himself up and find the courage he needs to move forward? This feature utilizes everyday concerns and passions that are relevant to anyone and thus finds its audience. 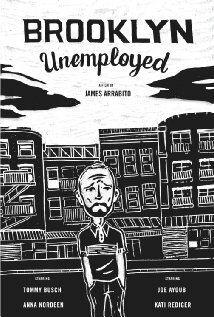 Through believable characters, their interactions with one another and such, Brooklyn Unemployed keeps viewers in tune with the events on-screen and even allows you, if you stop and listen closely, to know or maybe even possibly hear what is going through their heads during those moments of pensive pondering. The acting tremendously contributes to that as the lead is cast perfectly for such a role. A story of hope and a story of restoration, it is told well and yet somehow felt lacking to an extent. I can’t put my finger on it, but a part of me had wanted a bit more by the end. This is not a bad thing, just an aspect of note that it left me wanting something else for the character I had invested in by the end of the film, but it’s look toward the future after stepping back and re-evaluating life, gives audiences the same hope as the character and thus, we experience the same with him. One of the funnest shorts of the festival. It takes patience to produce a 16 minute stop-motion short that will remind viewers of a Saturday morning mini-cartoon. It also takes talent to create characters that portray emotions through the crafted facial expressions and garner support and empathy from the viewers. Dogonauts: Enemy Line accomplishes those feats and is a fun short that features two marooned enemies who face a dilemma of property damage and territorial control. The audio work partnered with the stop-motion animation and the absence of dialogue allows the visuals the strength to tell the story that is easily enjoyed by all and can only be described as top-notch. I was not expecting to like Dogonauts from the beginning but I quickly was taken by the wonderful warriors and it won me over! A refreshingly new (and yet old) treat you must not miss. Previous #WSIFF 2014: Selection Reviews, pt 1. Next #WSIFF 2014: Selection Reviews, pt 3.